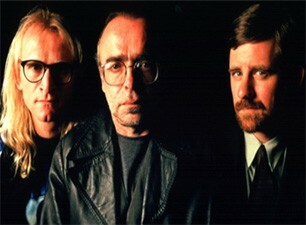 The Lone Gunmen, John Fitzgerald Byers, Richard "Ringo" Langly, and Melvin Frohike, are three of Mulder's sources who run the monthly magazine "The Lone Gunman: The Newsletter For Those Who Want to Stay Informed and Alive", a paranoid publication dealing with perceived government conspiracies, so called in reference to one of the many Kennedy assassination theories, with a circulation of around 2800 readers. They got their name from Mr. X in May 1989, when he said, referring both to the Kennedy assassination and to a cover-up they had just witnessed, "I heard it was a lone gunman". The paper appears to be a fairly wide-ranging publication, covering anything likely to be found in the "X-Files," and is funded by a young entrepeneur with the unlikely name of Jimmy Bond. They have long since proved very useful in providing both Agents Mulder and Scully information on any subject pertaining to the X-Files. Their office, located in Takoma Park, Maryland, is rather like Mulder's office, packed with books, files, computers, etc. They seem to live in their office, as well, which says much about their social lives. They also own an old, battered, pale blue Volkswagen van, a relic from the 1960s. Miscellaneous: Short, unshaven, often clad in combat boots and a mosaic of the "dirty old man," Melvin Frohike is an integral cog of The Lone Gunmen, having a great expertise in photo surveillance. Unlike the other two Gunmen, Frohike does not seem to belong to any clear-cut social group and it seems that he became part of the counterculture phenomenon in 1967, and is still as lecherous now as he was then. He also has a long-standing crush on Agent Dana Scully. He asks with interest about her when she and Mulder are split up, calling her "tasty", and once loaned Mulder a pair of night-vision goggles only after extracting Scully's phone number from him. Miscellaneous: The founding member of the Lone Gunman editorial board, John Fitzgerald Byers was named after President Kennedy, who was killed shortly before his birth. Byers worked for the FCC until 1989, when he came into contact with a former Department of Defense employee named Suzanne Modeski. Modeski had discovered that her supervisors were conducting unsavory experiments on an unsuspecting public. After a computer hacker who tried to help him was arrested, Byers turned to rival cable TV salesmen Melvin Frohike and Richard Langly for help. When the trio watched helplessly as Modeski was abducted by men in black, they became convinced that there were dark forces in the government, and decided to form a newsletter to expose injustice to the people. Byers lends a professional air to the Lone Gunmen offices with his neat beard, dapper suits and ties that seem out of place among his grungier colleagues. However, his sharp mind and no-nonsense demeanor attest to an encyclopedic knowledge of conspiracy theory and current speculation on everything from the Kennedy assassination to the latest in DNA research. Expertise: impeccable hacking abilities and communications expert. Miscellaneous: With his long, blond hair and black-rimmed glasses, Langly is the most outlandish of The Lone Gunmen trio. He was once a cable TV salesman and rival of Melvin Frohike; by day. By night, he was well known for his phenomenal computer hacking skills; the same skills that led John Byers to recruit him for The Lone Gunmen. He claims to have had breakfast with the man who shot JFK, and has a "philosophical aversion to having his image bounced off a satellite." Quick to catch an alternative rock band on tour in the area or to nitpick the scientific inaccuracies of a science fiction series, Langly is more outgoing than his comrades and the one most likely to joke with Agent Mulder.